If you are anticipating the hottest trends of 2016, I am right there with you. We all seem to be fascinated with what's coming next! Here are a few trends to look for in the new year in home design. 1) Kitchen Appliances. It seems the most popular color of appliances change every few years - remember the days of pastel ovens? Houzz predicts that sleek black stainless steel is the future trend for kitchen appliances. 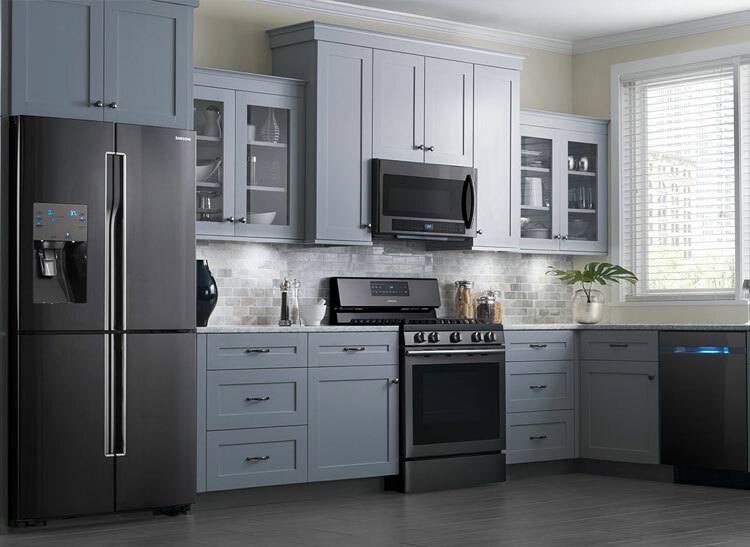 I have never been inclined to install bold colored appliances in my own home, but I do like the look of these sleek black stainless steel appliances and I can see them fitting into many kitchen schemes. 2) Soft, Muted Colors. 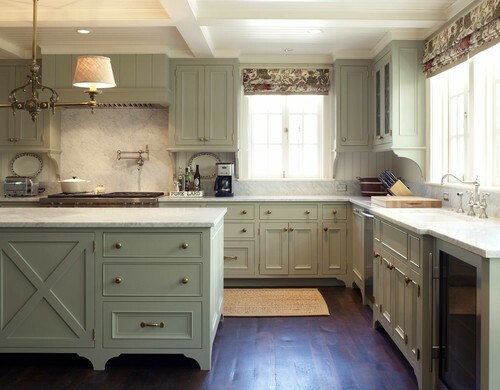 We'll see soft, muted color palettes in the kitchen, according to interior designer Jan Lockhart. 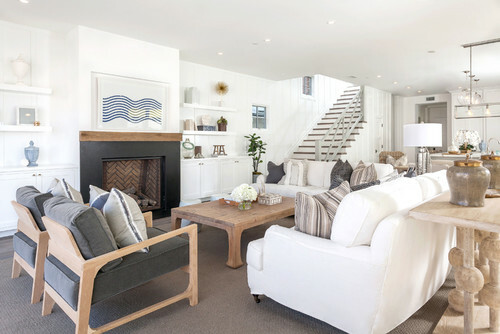 While white motifs will still dominate, "charcoal, grays and even neutral pastels like pale blue, pale green gray and tinted whites are the new alternative to the standard white," she says. If all you would like to change is the accent colors you're using in your kitchen, consider trying muted blues and greens and pale yellow pastel. 3) Metallic Finishes. 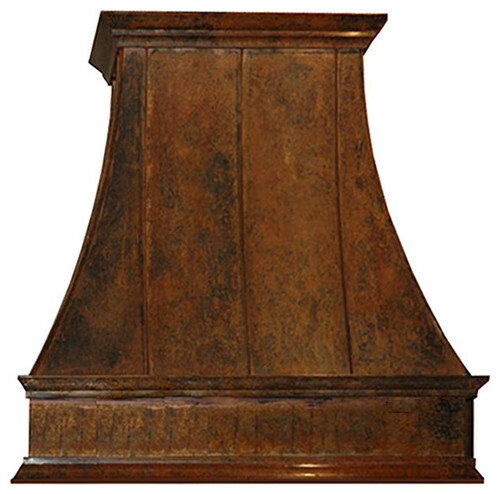 One of last year's biggest trends was small helpings of metallic finishes, be it copper, brass or bronze. We replaced faucets, pendant lights and cabinet pulls to incorporate this raw texture. However, in 2016 metal will assume a more dominate role in the kitchen. If you're planning to follow suit with this year's fixation on neutral color tones, or perhaps your kitchen is currently neutral, a metal hood (or wood and metal mix) can introduce a burst of contract into your kitchen and incorporate this raw texture in a big and bold way. You may find the sources found HERE as a starting point for inspiration. 4) Digital Free or Hidden. Tech-filled homes aren't going anywhere, but according to Houzz, more and more families are opting to keep their family rooms unplugged in order to facilitate more family time. Or, if you're not totally sold on "digital free," the new trend is to hide the gadgets. We'll see more wall units storing the hi-tech equipment and the fireplace once again serving as the new focal point rather than the large TV. People are arranging their furniture to put the fireplace center stage. 5) Heated Entryways. Heated floors have been popular in bathrooms for a long time, but bringing that technology into the entryway is brilliant, especially if you live in an area with cold winter months like here in Utah. Just imagine the bliss of stepping out of your cold snowy boots onto a nice toasty floor. 6) Bathrooms That Feel Like Living Spaces. 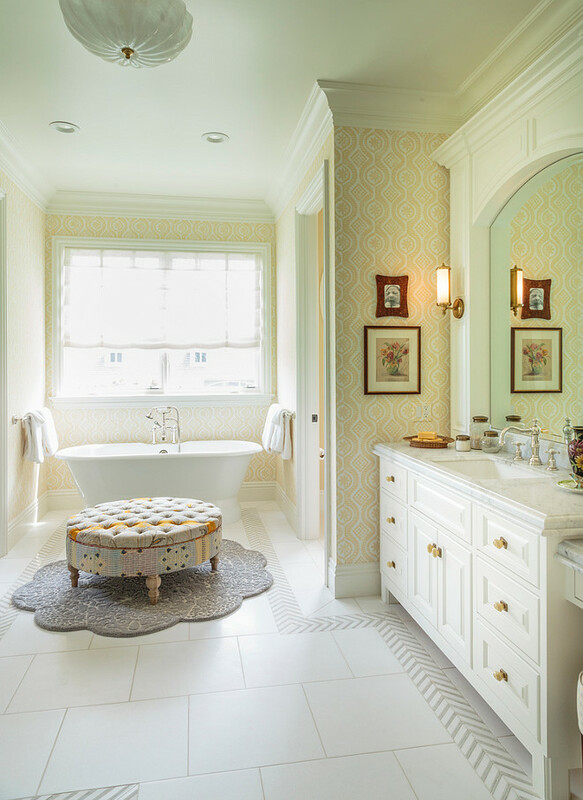 Bathrooms tend to be overrun by clutter and looking stark. The new trend is to add a chair or ottoman to help your bathroom look less stark and more welcoming. This is a trend that is affordable. Look for ways to update your bathroom to feel more like a living space and less cluttered. One of the projects I'm looking forward to sharing with you is a DIY ottoman. We can make one together for our bathrooms! 7) Wallpaper is Back. Pattern, texture and color are at the heart of the new looks for wallpaper. From subtle to bold, wallpaper is once again gaining steam. You'll find more choices and inspiration from geometric patters as in the photo above, to patterns used on the ceiling as seen below - and just about everything in between. The trend is not like we use to see when it was on every wall and in every room, but we'll see it used more sparingly. 8) Formal Dining Rooms. 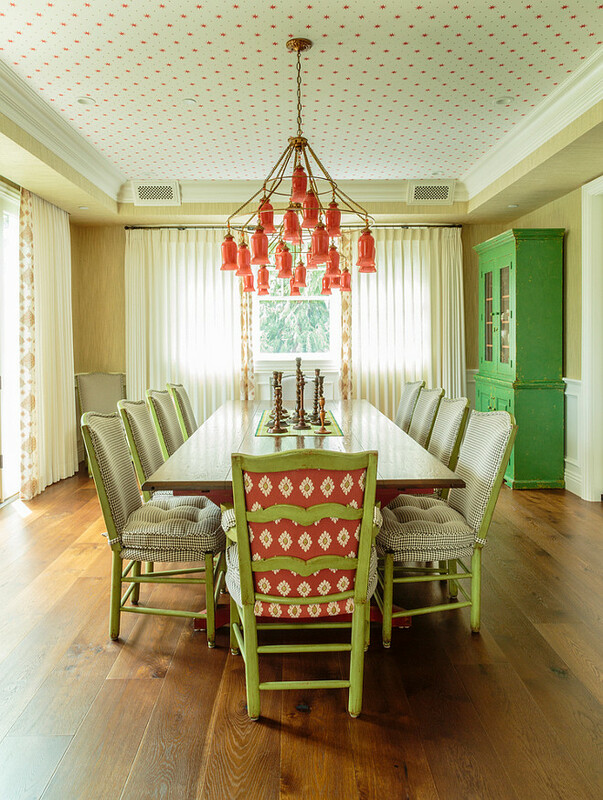 According to Houzz, we are beyond ready for sit-down family meals to make a comeback. More homeowners are opting to keep their formal dining rooms instead of converting them into media rooms or offices. This is a trend that I like. How about you? 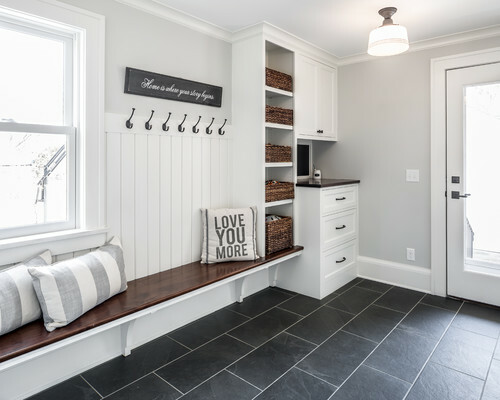 What do you think of the new home trends for 2016? One thing I know, trends come and go and we can't feel overwhelmed every year with all of the new trends and re-do or re-place. It's not feasible! These ideas are shared for entertainment and inspiration, but certainly not to make anyone feel their home is outdated. Love your home and your surroundings. Fill them with the things you love and that bring peace and comfort to your family. I love all of these trends for this new year!! The soft, muted colors, black stainless steel appliances, heated entry ways, all of it!! I thought you would especially love the kitchen! We should follow the latest trends for home designs so that we can easily get the new handy look for our home interior as well as exteriors. Most probably, we used to take the help of professional interior designers to get the best design for our home and apart from that, we can also take some valuable suggestion from different sources like from this article. I really appreciate the design and decoration system of this house, it will definitely inspire us to adopt these kinds of themes.